Do I need to explain this? Are there even people who don't watch Two Broke Girls? But just in case you need a primer, here's Tin's post, because I'm feeling a bit lazy (and tired). Also, I do realize that in order to be on the same page with TBG, I should also have money coming in, aside from money from my day job. Else, my total would forever be on zero, unless I also commit to save. Yes, there are apps out there that could certainly help make me aware of my expenses, but I tried that for two weeks, since January 2, 2012, and then I stopped. So here I am, pressuring myself to commit in front of everyone who might be reading. 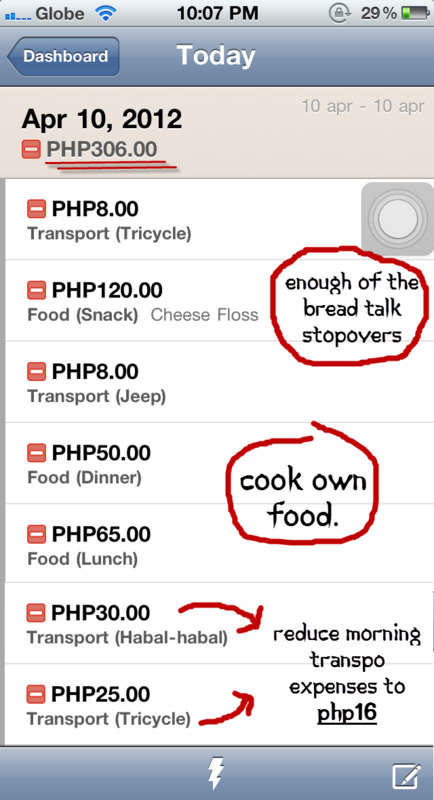 Expense tracker app brought to you by Piggie. Hi, I'm Jenn, and I'm trying to save. Really bad start, wouldn't you agree? With one craving, I suddenly made myself 120 pesos poorer. I can't pass by Bread Talk and not buy a cheese floss, or two. So now, I'll just remove that route completely. NO MORE MARKET! MARKET! STOPOVERS. As for my food situation, I long for the day my mini-fridge would finally get fixed. It's such a hassle to cook for one, and turns out to be more expensive too, that's why I often resort to fastfood. But really, I want to make an effort to go to the talipapa nearby to buy fresh produce, and then cook once for breakfast, lunch and dinner. Do I have enough willpower? And last but not the least, my morning commute total up to PHP55. Absurd price, when I can really just make it PHP16 every morning. It's just really hard to convince myself that walking isn't a chore, especially in the morning. "I walk to save 39 Pesos."